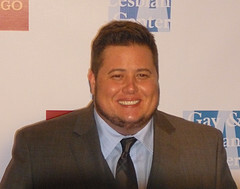 My red carpet chat with Chaz Bono! Chaz Bono will return to ABC’s Dancing With the Stars for next week’s finale along with all of the other contestants from this season. And yes, he will dance. Last Saturday, I chatted with the man who in the past year-and-a-half become the most famous transgender person on the planet. He was an honoree at the LA Gay & Lesbian Center’s gala and we had a quick gab on the red carpet. I wondered how he was feeling physically after the wear and tear of his stint on DWTS. Chaz, the only child of Cher and the late Sonny Bono, has emerged as a major public figure in his own right with DWTS as well as the documentaries Becoming Chaz and Being Chaz and a recent memoir. I remarked that watching him on DWTS, he just seemed happier now than ever before. Although Chaz was eliminated at around the halfway point of the season, he was surprised at the level of support he got from viewers – especially considering there was some pushback prior to the season from transphobic forces. Chaz believes that that American society will continue to evolve and become more hospitable to LGBT folks.